A recent ccession of the Museum is a XVI century Italian portrait of the Lombard school, ascribed with a high degree of plausibility to the painter Gianpietrino ( Pietro Rizzo or Ricci), who flourished at Milan during the latter part of the XV century and the opening years of the XVI century. He was not only an imitator of the style of Leonardo da Vinci ; but was, with Boltraffio, Marco d’Oggionno, Salaino, Giovan Antonio Bazzi and Cassare da Sesto, a direct pupil of the master. The gentle smiling countenances of Gianpietrino’s female heads are immediately recognized as reproductions of Leonardo’s enigmatic smile as typified in the Mona Lisa. Of all the members of the Lombard school, Gianpietrino was perhaps most successful in retaining this dreamy, poetic expression. He usually painted only half length figures, rarely large altar pieces; and many of his works were until comparatively recent years ascribed to his master. He lias often been confused also with Sodoma, Luini and Marco d’Oggionno. His work is now generally identified by certain characteristics of drawing, by its cold gray modelling, and by the peculiar golden red color of the draperies. His studio is said to have been one of the busiest and most frequented in Milan between the years 1520 and 1530. The painting acquired by the Museum has been given the title “A Young Patrician Woman/’ in the absence of any record of the identity of the sitter. It is a bust portrait on a wooden panel, 24 by 19 7/8 inches. 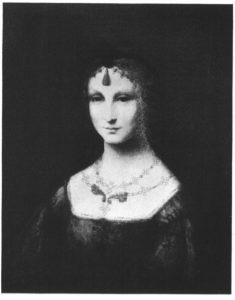 The likeness is that of rt young woman of unmistakably noble birth and gentle breeding, as indicated by the elegance of her features and the dignity of her expression. The patrician beauty of the face is enhanced by a fascinating, enigmatic smile which plays gently over the softly molded contours, imparting to the countenance an air of ineffable charm. The rendition of the features is accomplished with great delicacy and precision, the modelling with its cool gray shadows, having a pronouncedly sculpturesque quality. The golden colored hair hangs down in minutely painted ringlets, and is confined at the brow by a dark ribbon from which jewels are pendant. She wears also a gold necklace of intricate design with Renaissance ornament. The low cut bodice, with its full sleeves, is painted in the rich orange red tone usually found in Gianpietrino’s draperies; and the background is now almost black, blending with the shadows of the figure. The color scheme of the portrait is one of unusual richness and depth and accords well with its alluring air of mystery.